Every appliance replacement is an opportunity to increase the beauty and flair of a boat's interior. Improved controls deliver more efficient operation. The redesigned Icerette from Raritan offers more unique features, style, and convenience than before, which enhances indoor environments. 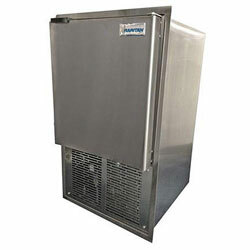 The Icerette marine icemaker is specifically designed and built for the rigors of harsh marine conditions, such as full sun, saltwater, and sea air.This icemaker's cabinet and door are made to last. A copper condenser adds further protection. Designed for easy installation, no drain is required, just a 1/4" outside diameter water line, simplifying the process and lowering expenses. Raritan's Icerette comes with a flange for recessed mounting. The series is available in 115/230 Volt versions. All units are CE certified, while the 115 V model is also UL and cUL listed. Positive catch door latch keeps door closed.